Author Topic: Tube launched torpedo MK's? Does anyone know if anything other than Mk. VIII torpedo's were fired from Elco PT Boats when they were fitted with torpedo tubes? The reason I ask is that some of the photo references I look at appear to have different shaped warheads. Any thoughts on the subject? The Mark VIII or (Mark 8) with the smaller warhead and the Mark XIV or (Mark 14) with the larger warhead were both used on USN PT boats. both with 21 inch diameter to fit the standard USN tubes. Ref. At Close Quarters and archival images. PT 61 also carried MK XV torpedoes at one time during Spring 1943, as related to me by Ken Prescott, they got them from one of the destroyers passing through Tulagi. Thanks for the info. It makes sense as the Mark 15 torpedo was very similar to the Mark 14 and of course had the same diameter that allowed it to fit in the tubes. I always wondered why they leaned more toward the Mark 8 and Mark 14 torpedoes to be used on the PTs fitted with tubes. Maybe it has something to do with the balance weight along the length the Mark 14 warhead carried a 507 pound charge and the Mark 15 a 780 pound charge. Or maybe the newer Mark 15 were made more available to the Destroyers. Or maybe there were a bunch of WW1 vintage and betweeen the wars torpedos the powers thatbe wannted used? Remember the fiasco with the early M-16 rifles because the government insisted that the existing stocks of powder be used even though it had been explained to them that it was the wrong type of powder and the residue from it would foul the action? "Give me a faster PT boat for I'd like to get out of harm's way!" I found this picture from the PTKing web site. Looking at the pictures I've seen of the 105 boat I think this is going to be the look I'm after. It looks like the Mk. XIV has more of a taper and point to it than these Mk. VIII torpedoes. I'm going to cast some up in resin and give it a nice bronze nose. The mounts are interesting. Looks like there are three of them, and obviously this shot is long before the "roll-offs" were invented. I don't see what is securing the fish to the cradles. Those are just come alongs for the Torpedoes. 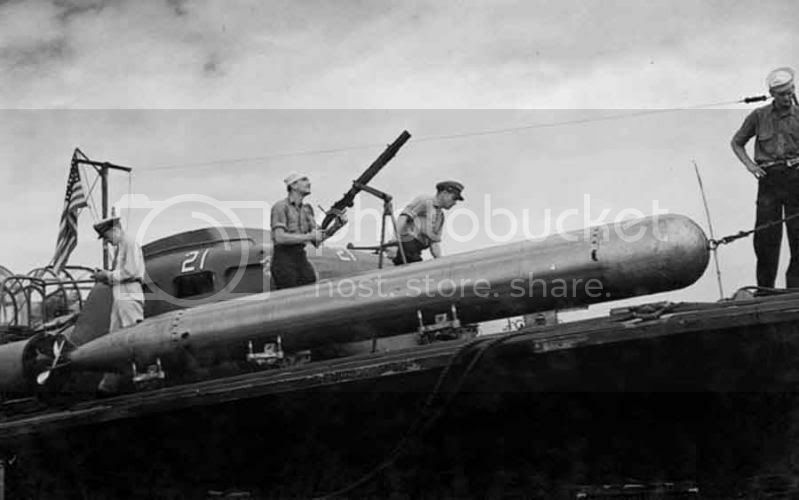 Placed on the deck, they rolled the torpedo into the waiting tube. The weight of the torpedo must have kept them in place until fitted into the empty tube. The simple answer about the choice of the Mk. VIII's for PT use was that it was the only torpedo available in considerable numbers (around 9000 in the Navy's inventory, according to one source) when it was decided to up-rate the boats from 18 inch tubes to 21 inchers. Production of the Mk. XIV's and XV's was just getting underway at that time, and there were only a small amount of each on hand--and the destroyermen and submariners had first dibs. I'm not at home right now, but I'll look into this when I get home.